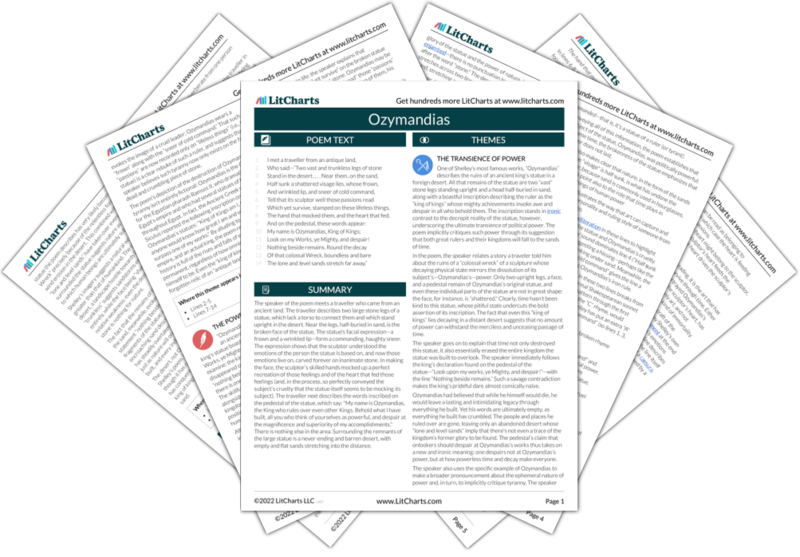 Instant downloads of all 945 LitChart PDFs (including Ozymandias). “Ozymandias” is a sonnet written by the English Romantic poet Percy Bysshe Shelley. Shelley wrote “Ozymandias” in 1817 as part of a poetry contest with a friend, and had it published in The Examiner in 1818 under the pen name Glirastes. The title of “Ozymandias” refers to an alternate name of the ancient Egyptian pharaoh Ramses II. In “Ozymandias,” Shelley describes a crumbling statue of Ozymandias as a way to portray the transience of political power and to praise art’s power of preserving the past. Although the poem is a 14-line sonnet, it breaks from the typical sonnet tradition in both its form and rhyme scheme, a tactic that reveals Shelley’s interest in challenging conventions, both political and poetic. 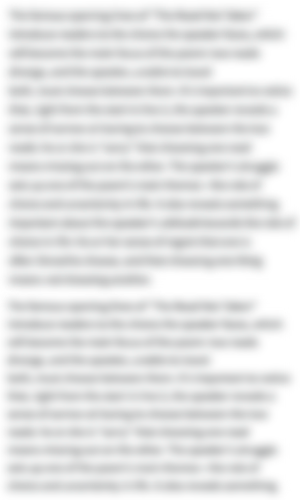 You can read the full text of “Ozymandias” here. Get the entire guide to “Ozymandias” as a printable PDF. Download it! 11Look on my Works, ye Mighty, and despair! Unlock all 268 words of this analysis of Lines 1-2 of “Ozymandias,” and get the Line-by-Line Analysis for every poem we cover. Unlock all 694 words of this analysis of Lines 2-3 of “Ozymandias,” and get the Line-by-Line Analysis for every poem we cover. Unlock all 531 words of this analysis of Lines 4-5 of “Ozymandias,” and get the Line-by-Line Analysis for every poem we cover. Unlock all 747 words of this analysis of Lines 6-8 of “Ozymandias,” and get the Line-by-Line Analysis for every poem we cover. Unlock all 418 words of this analysis of Lines 9-11 of “Ozymandias,” and get the Line-by-Line Analysis for every poem we cover. Unlock all 889 words of this analysis of Lines 12-14 of “Ozymandias,” and get the Line-by-Line Analysis for every poem we cover. Unlock all 257 words of this analysis of enjambment in “Ozymandias,” and get the poetic device analyses for every poem we cover. 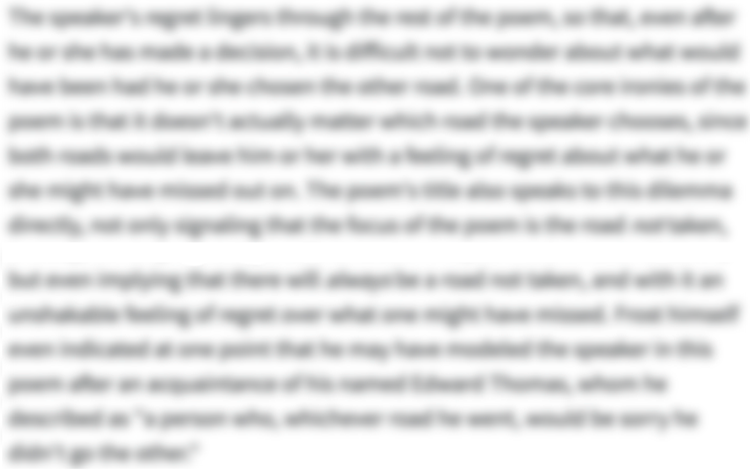 Unlock all 224 words of this analysis of caesura in “Ozymandias,” and get the poetic device analyses for every poem we cover. Unlock all 93 words of this analysis of alliteration in “Ozymandias,” and get the poetic device analyses for every poem we cover. Unlock all 139 words of this analysis of irony in “Ozymandias,” and get the poetic device analyses for every poem we cover. British Museum: The Younger Memnon — This website shows the statue of Ramses II (Ozymandias), the discovery of which may have inspired Shelley's poem. Breaking Bad and Ozymandias — The tv show Breaking Bad featured the poem "Ozymandias" in a trailer for the final season. The BBC explains why and embeds the trailer in the webpage. British Library's "Introduction to Ozymandias" — The British Library has a short introduction to "Ozymandias" that includes excerpts of potential sources for the poem, historical information about Ramses II (Ozymandias), as well as details about Shelley's radical politics. Draft of "Ozymandias" — The Bodleian Library at Oxford University digitized and transcribed an early draft of "Ozymandias" from 1817 and made it available online. "Ozymandias": Original Printing — Shelley first published "Ozymandias" in The Examiner in 1818, under the name "Glirastes." This is a scan of the first edition printing. Swafford, Annie. "Ozymandias." LitCharts. LitCharts LLC, 21 Dec 2018. Web. 10 Apr 2019. Swafford, Annie. "Ozymandias." LitCharts LLC, December 21, 2018. Retrieved April 10, 2019. https://www.litcharts.com/poetry/percy-bysshe-shelley/percy-bysshe-shelley-ozymandias.